When I was pregnant with Elizabeth, I tried (unsuccessfully) several times to knit something. I gave up shortly before she was born, fed up of not being able to make a little hat for my unborn child. Then last year, shortly before we moved whilst we were away in Cornwall, I took a renewed interest in knitting. Whilst in a petrol station, browsing the magazines, I saw a knitting magazine and decided that the holiday was a good chance to start knitting again. Then, with the move and everything that surrounds it, the knitting I started whilst on holiday got set aside and forgotten about. After moving and sorting through all the many boxes, I came across the knitting needles and sewing kit that used to belong to my Nan and so I decided that I would start knitting again and see if I got anywhere. Well, as you can imagine, things were pretty hectic for a while after we moved and it was only earlier this year, after we found out that we were expecting our second child, that I started knitting again. 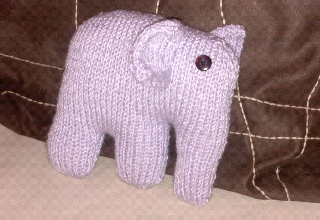 I went back to that same magazine I bought in Cornwall and found a cute little two-legged elephant to knit. I decided that 6 months was enough time to knit something for the new baby so I dug out some wool and set to work.